I'm new to the whole pond scene. Don't even quite understand the some of the terminology y'all use. I just bought a 2.8 acre pond in south Louisiana. The pond has 0 aeration. I purchased a 1hp gast pump and from my research I think it will do the trick. But the diffusers.... not sure how I'm going to set them up or what to use. Is there a such thing as to much oxygen? Is mine not enough but anything is better than nothing? I have a long road ahead and just decided to start here. Thanks for any input any one has. Thanks!! Welcome to the PB Forum. Many people are here with good answers to your questions. You could start with some reading located in the Forum List. I will try to answer some you mentioned but understand I am not an expert like some others here. Diffusers, I run Kasco but there are several different brands to chose from. My pond close to your size pond I run 6 diffusers but it depends on ponds bottom designs. You might get away with 3. I could see where there might be to much oxygen but not sure you can get there. But anything may not be better than nothing. So, continue with your research, ask questions and read a lot here. It has more information than you care to even think about regarding aeration. Start there and if you get stumped on the terminology just jump back to this thread and post your questions. You can have too little aeration. If your system is too small it will end up bringing up poisonous water constantly because it will never get out ahead of it and eliminate the poisonous conditions that naturally occur in the depths of the pond. With that said, the Gast 1hp pump that you have selected is, likely, a good candidate for your size of pond. You are on the right track, so far. 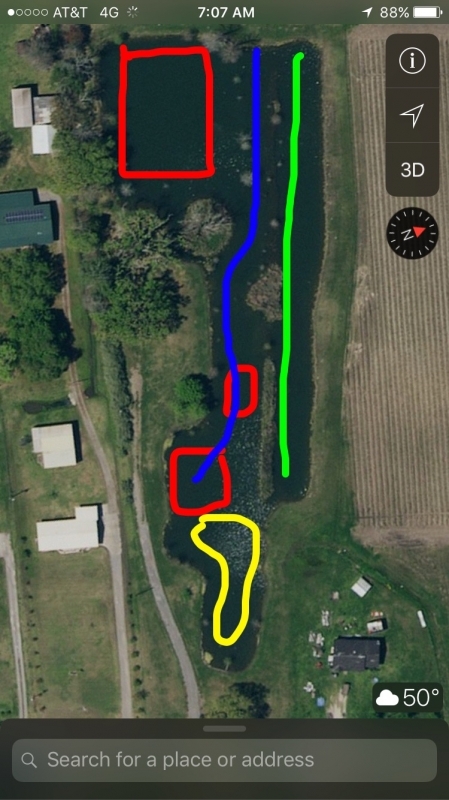 You should sketch your pond and map out the depths in different places, then share that sketch with the forum. This will help you decide where to put the diffusers and how many. A simple bowl-shaped pond is very simple to figure out, but the odd-shaped ponds and/or ones with crazy bottom contours take more consideration. If you have the GAST 1hp rotary vane pump then you should be looking at running 7 to 10 diffusers. The exact number depends on the depth of placement, the diffuser brand, and budget. Too few diffusers and you will be overpowering them with that big of a pump and too many diffusers and you will not get the most out them with respect to water lift/movement. The GAST 1423 would produce about 9-10 CFM in a typical pond setting. The vertex brand diffusers are recommended to run at 1 CFM per diffuser. If I had to guess, you are not going to get anywhere near the same water movement with the DIY diffusers as you would with something like a Vertex. Please post your results. Did you get the Gast 1423 that QA mentioned? Yeah buy something like Vertex. How would you even measure how effective yours is? I'm all about experimenting and DIY, but I can say that the vertex diffusers have so many more holes (actually slits) than 50. My guess is that they have about 1000. They are actually designed so that the slits open up just enough to allow your air flow to escape. This keeps the holes from being larger than they need to be. Smaller holes make smaller bubbles and that is supposed to increase water movement. You have one of those "odd-shaped ponds" that I mentioned and your 2.8 acre pond will require more diffusers than a normal round one. My GUESS is that you will want one in each of the red areas, one in the yellow (far from the red square), two for the blue (one near the island, one at the NW end), and two for the green (one by the island, one at the NE end). This should leave no dead zones. I hope others here at PB will back me up or give reason otherwise as I am just trying to use what little common sense that I have. I think for experimentation purposes, I would focus on the big red area at the NW corner and do a lot of temp checks as you get further from that area. I bet that the far ends and the strip to the north would get little benefit. What I don't know, should you only aerate the big red square, is...will dead water be constantly created in those coves and migrate too slowly to the diffusers causing a constant mixing of low DO water. This would hurt more than help. I also think you should reconsider using professionally made diffusers because your pond is so strung out. I should say that I love the diverse shape of your pond...very cool! I agree with QA on your diffusers. If you're dead set on building your own, I think you'd be better served using soaker hose as your diffusers. They still wont produce as many tiny bubbles as a membrane type diffuser, but soaker hose will definitely outperform what your DIYing. You also need to consider installing some kind of check valve on each diffuser to prevent water from completely filling your supply lines. Otherwise, your pump is going to wear out prematurely from trying to push all that water out of the lines every time you turn it on. But now I have a different set of issues.... my gast 1423 came In today. I wasn't aware that this pump came in 1 phase and 3 phase. Well this one is 3 phase. So it's either find a motor that will match in 1 phase (if it can be matched) of have a pump that I can't use. My question is. I also have a 3/4 gast pump. Do you guys think that's enough to run enough difusers for my pond? Which 3/4 hp Gast pump do you have? Is it a rotary vane pump? They have the 0823 and the 1023 in the rotary vane catagory. After looking at the pump curves for the 3/4 hp pumps...you will not be able to put any diffusers deeper than 16 foot max and the 0823 would only handle, maybe 6 diffusers. The 1023 could handle up to 8, but that might be pushing it. The 1023 will work IF you really pay attention to the plumbing, but it would be riding the line and would be working as hard as it could. Do you have an estimate on how many gallons are in your pond? This would help to determine the turnover rate. Bottom line: Even the 1HP pump would not get deeper than 16 foot, but could handle the 8 diffusers with ease. These pumps are limited by their output pressure. A positive displacement pump, like a piston pump would allow for more pressure which means deeper diffusers. Going to the bottom is not necessary, so we'll talk options after you get back with some answers. They have a single phase version of the 1423. Maybe you just ordered the incorrect version?? I would talk to who you ordered it from and exchange it for the single phase. Will probably cost some shipping $$ but better to have the correct pump. Before I gave up the return I would suggest going to your Ebay purchase history and hit the return button and see how it plays out. I've found a very liberal policy even when not stated as such. Not 100% but worth a try. They have free shipping, but the cost is about the same as Granger. The pump is a gast 3/4 hp. First 4 numbers of the model number is 1022 not 1023. Is that the same thing?